Also, Spiritual Awakening at Yahoo, etc….. Contents Below — In This Issue/Mailing/Blog/Digest: an introduction to Sant Mat: a new podcast at Youtube; a program about the Sikh Religion and scriptures; podcast on vegetarianism in early Christianity; quotes from: the Ebionite Gospel on the reincarnating Christ of the ages — appearing in different cultures; John Lennon on Gnosticism; the German mystic Mechthild of Magdeburg on seeing the inner Light from her spiritual classic, ‘Flowing Light of the Godhead’; ‘static’ of the Big Bang (according to NASA); a letter from Kirpal Singh; Tulsi Sahib’s and Maharshi Mehi’s Ode to the Classic Sants of India; on the great 19th Century Master Baba Devi Saheb; excerpt from a clearer translation from Dayal Bagh of ‘The Last Words of Soami Ji Maharaj’, shedding new light on his appointment of Huzur Maharaj in Agra; Soami Ji Maharaj on early morning meditation from his ‘Commentary on the Jap Ji’; guidance about inner Sound Meditation (Surat Shabd Yoga) from Shiv Brat Lal, Maharshi Mehi, and Swami Achyutanand Baba (“Not Just Any Sound”); and we conclude with a message of compassion and non-violence. If we could only still our intellect and remain embedded with love and trust in him, then we could reach our true Home without any exertion on our part. God is love. When our soul comes in contact with his overflowing love, we are saturated with his love through and through, which washes away all dirt of sins of the past and merges us in oneness with the Father. Peep and continue peeping within your self with overflowing love to see and contact the Master Power residing in you, who will then manifest to you and guide you step by step on to the path of Truth that your love will open for you. Stand on your belief on solid ground. Let not others’ wayward opinions deflect you from the true path you are on. Let not promises of glory by anyone waylay you. Do not come to hurried conclusions, but use discrimination in all your undertakings. Stick to what is Real. With an ethical and loving background your spiritual success is definitely assured. My love and best wishes are always with you in all your noble efforts and holy journey to your Home. You are protected by the Master Power working overhead. Depend on him. You will have all the necessary inner help. The Master Power is waiting for his dear children to come to him within. 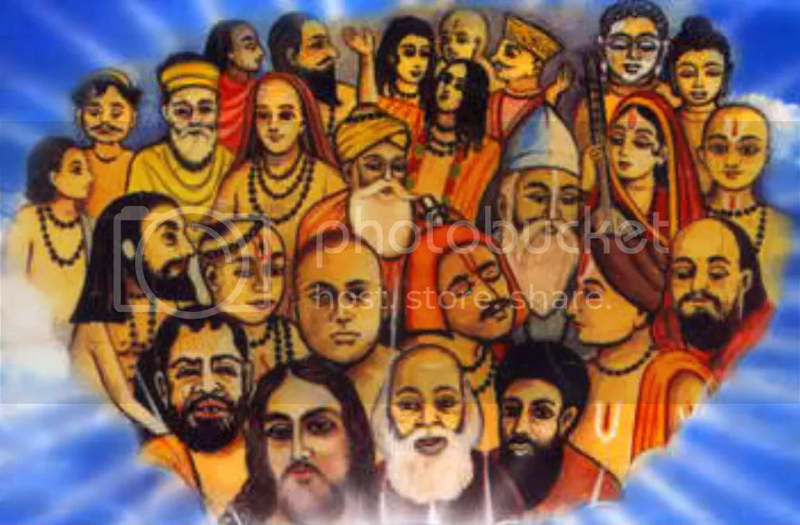 “The Saints of India” — Can you identify some of the great Sants, Mystics and Masters in this jpg icon? I see Buddha and Mahavira next to each other, in the back. In front of them, Mira Bai. In the center, with a white beard and turban, is Guru Nanak. To his right, also with a white beard, is Guru Kabir. In front, pictured as bald with a white beard, is Baba Devi Sahab, disciple of Tulsi. To his left, with afro hair and black beard, is Param Sant Tulsi Sahib of Hathras. You may be able to recognize others in the crowd as well, Tulsi Das, Ramakrishna, Tukaram, Namdev, perhaps more. they are the world’s benefactors! In an easy way everywhere they propound! Foes of sins, great were Shankara and Ramananda. Glory to Guru Nanak who was so great! Jagjeevan, Paltu — they robbed us of all fears! And who ever will be! Prostrate at their feet we are! And place at their lotus-feet all my expectation! “I (Tulsi Saheb) have described the status of Sants and sung of hymns composed by them. Sants have traversed the path to the Inaccessible Region and their Surat has attained the Truth or Essence. “Nanak, Dadu, Dariya Saheb, Mira Bai, Soor Das, Kabir and Nabhaji have all reached the Nabh (sky, high region) and have given out the secrets. Their Surats have got across and merged there. Hail Baba Devi Saheb, one of my favorite Sants of the late 19th and early 20th Centuries: Blessed by Sant Tulsi Sahib, part of the Hathras Sangat, friend of Huzur Maharaj (the great disciple of Sant Radhasoami Sahib), Proponent of Sant Mat, and lover of the Beloved. There are inner Sounds that one receives guidance from a true Master about at the time of initiation into Surat Shabd Yoga (Inner Sound Meditation, Yoga of the Audible Life Stream). These Sounds appear to come from the right side or center and represent the Ascending Current. Sounds that appear to be coming from the left side are of the descending current flowing downward into the material creation. One is instructed to focus on the Sounds of the Ascending Current or Audible Life Stream — certain Sounds. There are of course many other sounds one might hear, but one has to focus on certain Sound Currents. The reason for this is these Sounds, if focused upon during meditation practice, will keep pulling the soul’s attention up to ever higher and higher levels. These are coming from regions above. Other sounds, though interesting, miraculous or mystical, will not help the Surat-soul to ascend or make spiritual progress. “The soul has to concentrate on the Sounds that are heard ricocheting within by practicing nada dhyan/surat shabd yoga/nadanusandhana [Inner Sound Meditation]. Countless varieties of Sounds including the ocean’s roar, thunder of clouds, melodies resembling those of musical instruments like drums, sitar, lute, flute, etc…. are heard. These Sounds are so captivating and pleasing that the soul forgets everything else. These Sounds become more and more melodious as one moves into higher and higher realms. By receiving the complete spiritual guidance of a true Guru one can grasp the Five Central Sounds, as described above, one after another and go on rising further and further. All these words or Sounds are flowing from the higher realms and by merging with them it is very much possible for the perceiving soul to keep ascending, just as a fish can swim against the stream or current.” — Swami Achyutanand Baba, Yoga of Inner Light and Sound, a new book on Sant Mat. Our founders, Guru Nanak, Kabir, Tulsi Sahib of Hathras, Swami Ji Maharaj, etc…. and their successors have all instructed initiates of Surat Shabd Yoga (Inner Light and Sound Meditation) to adhere to a peaceful ethical foundation that includes the vegetarian diet. Killing is not a right. KILLING IS NOT A FREEDOM. Killing is not a choice.